Ions in soil solution are attracted by ion-exchange membranes of opposite charge, but repulsed by those with the same charge. 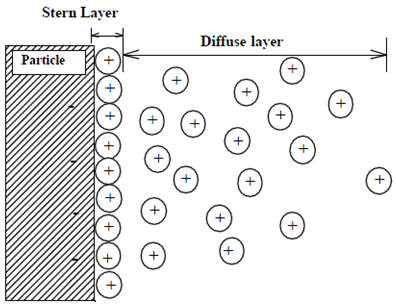 The resulting distribution of ions adjacent to charged surfaces is referred to as a diffuse double layer. Attracted ions are exchangeable, but must be replaced by ions of equivalent charge to maintain electrical neutrality (Donnan exchange principle). Ions with higher valence or smaller hydrated diameter are attracted more strongly than ions with lower valence or larger hydrated diameter. Initially, the exchangeable ions on PRS® Probes (i.e., counter-ions) have low valence and large hydrated diameter, and thus are easily displaced by ions from soil solution. When PRS® Probes are first inserted in soil, the rate of exchange is Diffusion Dependent: the flux of ions to the ion exchange membrane is controlled by the activity and diffusivity of ions in soil solution. The process is similar to that occurring in the soil-root system, in which roots adsorb nutrients from soil solution by releasing counter ions such as H+, OH-, and HCO3-. In both systems, a critical rate-limiting step is diffusion to the sink in response to gradients established by dynamic equilibria. Eventually, the quantity of a specific ion adsorbed on the ion exchange membrane often reaches a constant level that is Equilibrium Dependent, it depends on the relative activity in soil solution and relative affinity on the membrane of the ion. Relative affinity of an ion on a resin membrane (or other soil colloids) is most strongly influenced by valence: divalent ions are retained more strongly than monovalent ions, and trivalent ions are retained even more strongly. Within a given valence, ions that have a smaller dehydrated radius are generally held more strongly. Soils are constantly undergoing change, and therefore the quantity of ions adsorbed on PRS® Probes may also change. The principles of ion exchange continue to apply. Increasing activity of an ion that is strongly held will generally increase the quantity of that ion on PRS® Probes and reduce the quantity of ions that are weakly held. Conversely, declining activities of a strongly held ion may not result in the amount adsorbed by PRS® Probes unless the activity and affinity of other ions is sufficient to displace the strongly held ion. In some systems with high ion activity (e.g., saline soils, fertilizer bands), net adsorption may be limited by the capacity of the PRS® Probe to hold ions.